Cathay Pacific has four flights daily from London Heathrow to Hong Kong International Airport. But what are its lounges like for premium passengers? Business Traveller takes a look. The lounges are now at Area C in the airside area of T3, accessed by heading towards the gates and then turning left past the SAS London Lounge. Discreet sliding doors take you into a vestibule area, and then a lift takes you up to the second floor where the first class lounge is on the left and the business class lounge is on the right. In the picture here looking down the corridor the washrooms are on the left, an unsigned door on the right takes you through to first class (the main entrance is out of sight to the right of this photo) and the business class lounge is at the end of the corridor via a right turn. In total the lounges measure 923 square-metres. Wifi connections are available though make sure to get the code form reception. There are five shower units “shared” by business and first class, and although the washrooms are smart with white marble finishing in the shower areas, and clean lines, they do get very busy. Walking through into the lounge a right turn takes you past the work area where there are stations with PCs and plugs to power your own devices / laptops. The main area is made up of over 100 sofa seats with a signature Cathay Pacific Noodle Bar, similar to those at the lounges The Wing and The Pier at Hong Kong International Airport. There is a serving hatch for noodle orders. You simply ring the bell and your order is taken from the short menu available. The lounge has floor to ceiling windows with lots of natural light coming in from the runway apron area and has been cleverly broken up with some wood partitions down one side to create some privacy – eight “personal living spaces” as they are termed by Cathay (you can’t see them in this picture but they are to the left of it – the noodle bar is to the right).It means that when you first walk in you can’t immediately see everyone in the lounge, and likewise, you aren’t met with several dozen people looking up to stare at you. The first class lounge is just visible over the partition wall to the right. 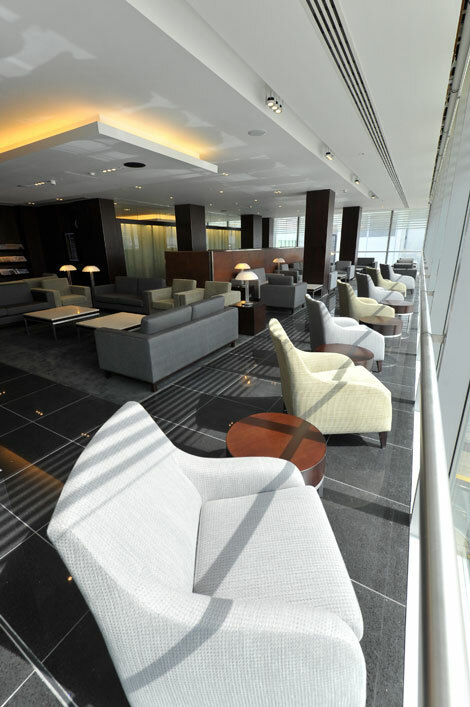 Like the business class lounge, the first class lounge has floor to ceiling windows and good – possibly better since it is on a corner – view of the runway apron. The first class lounge has five computer/ work areas, which fill quickly with either those wanting to use the PCs available or simply sit at a table while working on their own laptops. There are plenty of plugs available next to the (49 in total) sofa seats if the work stations are all occupied. The washrooms are accessed from the corridor between the two lounges and there are five shower suites. As in the business class lounge, there is a large plasma screen TV. Verdict: the lounges are an improvement on Cathay’s previous offering, not least because of the natural light which, at least during the summer, will be good for the three evening departures, and will always be useful for those flying at lunchtime. Terminal 3 at Heathrow is a crowded place, and these lounges are very calm, with spa-like music, lots of place to sit and relax, and a moderate range of food (the noodle bar is signature, but other than noodles, the choice isn’t huge in either lounge). A welcome addition for Cathay’s regular flyers and its premium passengers. The lounges are open between 0530 and 2200 for eligible passengers. – First Class passengers of Cathay Pacific. – First Class passengers of all oneworld alliance airlines. – The Marco Polo Diamond Club members when travelling on Cathay Pacific flights, plus two guests. – oneworld Emerald status members when travelling on Oneworld alliance airlines, plus two guests. – Business Class passengers of Cathay Pacific. – Business Class passengers of all oneworld alliance airlines. – The Marco Polo Club Diamond Card members when travelling with other carriers, plus two guests. – The Marco Polo Club Diamond members when travelling on Cathay Pacific, plus two guests. – The Marco Polo Club Gold Card members when travelling Cathay Pacific, plus one guest. – The Marco Polo Club Silver Card members. – oneworld Sapphire status members when travelling on oneworld alliance airlines, plus one guest.